East Africa hasn’t urbanized at the same rate as the rest of the world. While over 50 percent of the world’s population now lives in cities, the East African region of Tanzania, Kenya, Uganda, Rwanda, and Burundi - the members of the regional intergovernmental organization East African Community - will only reach an urban population of 31 percent by 2030. But while the countries as a whole aren't following the urbanization trend at the same pace as other places, some of their biggest cities are among the fastest growing in the world. Of the projected top 20 fastest growing cities in the world from 2010 to 2025, five of them are located in East Africa. Kampala, Uganda is expected to grow by 99.5 percent, followed by Dar es Salaam, Tanzania (85.2 percent), Kigali, Rwanda (79.9 percent), Mombasa, Kenya (79 percent), and Nairobi, Kenya (77.3 percent). To deal with the strain of urban population booms some of these cities are turning to satellite cities as part of their solution, according to a report, State of East Africa Report 2012, from the Society of International Development. Four satellite cities have been constructed or proposed in these East African countries: Outside Nairobi, Tatu City and Konza Technology City, Kigamboni adjacent to Dar es Salaam, Kakungulu in Kampala. But will these satellite cities actually address the problems associated with high rates of urbanization or will they make things worse? I emailed one of the reports co-authors, Ahmed Salim, in Dar es Salaam, to get his take on the complex, "double-edge sword" of satellite cities. Why is there a focus on using satellite cities to improve conditions? The interesting thing about the satellite cities project is that there is no clear indication that the region’s governments and city managers all decided one day to deploy satellite cities as a solution to rapid urbanization. Satellite cities are driven by business developers and as a result are being promoted by businesses and are consequently labeled as the future of well-organized urban spaces. These satellite cities hope to tackle two different aspects: accommodating urbanization and creating modern cities to complement development. They also seek to embrace their respective countries' advantages. For instance, Konza City in Nairobi, Kenya is a multi-billion dollar ICT city park. 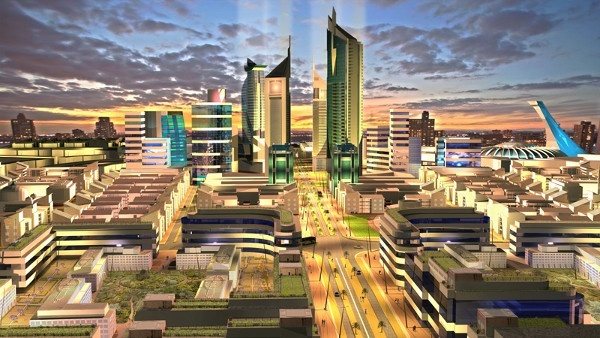 The Kenyan Permanent Secretary in the Ministry of Information and Communication expects Konza City to be Africa’s home of computerization, the equivalent of Silicon Valley in California, complete with skyscrapers, business centers, international schools and hospitals. It is no secret that Nairobi aspires to be the technology hub of East Africa. Another reason why there is such a focus is explained by the Government of Tanzania which claims that satellite cities would hope to bring urban services closer to residents and consequently decongest the city center. This strategy implies that the only way to improve city conditions would be to have less people traffic. Perhaps only then can authorities focus on developing the original cities. Do you think this is the best solution? Shouldn't existing cities invest in improving existing infrastructure, transportation and housing to deal with rapid urbanization? Having satellite cities is a double-edged sword. It is advantageous especially in terms of development and thinking about the future in an innovative manner. However, the criticism, which your question implies, concerns why would the authorities invest in new adjacent cities when current ones are not up to par? If the argument to build satellite cities is to expand the city and accommodate the growing population it makes sense to build satellite cities. If we are talking about sustainability, satellite cities may not be the best solution because it deviates away from improving the ‘older’ cities. The question is, would improving existing infrastructure, transportation and housing really deal with rapid urbanization? Improving infrastructure and transportation may ease up the pressures of the movement of people but I doubt it will necessarily deal and accommodate with rapid urbanization. Hence, an alternative like satellite cities. You mention in the report that these satellite cities could become enclaves for the rich. What do you think will be the long-term impact of this out-migration on the urban cores? I think one of the long-term consequences would be a type of nouveau apartheid or segregationist society. Most of the satellite cities are geared towards a certain class of people, and this is clearly marked by the potential costs of living and working within these cities. As the report indicates, "the poor and vulnerable populations in the mother cities face an increased risk of further marginalization and impoverishment […]"
The mother cities would be left with drastic economic and even human capital loss. For instance, skilled and qualified workers would migrate to these satellite cities for a chance at sustainable and well-paying jobs. Regular cities would face an economic deficit and would potentially be seen as lost cities because of the perceived notion that only the poor live there. We may see the first instance of metropolitan cities turning into slums. This may sound extreme but not necessarily far-fetched.